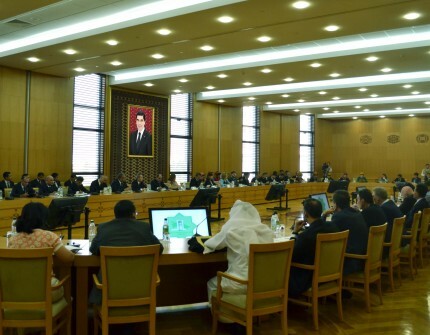 On August 27, 2018, the briefing devoted to the outcomes of Heads of the States-founders IFAS was held in the Ministry of Foreign Affairs of Turkmenistan. The Heads of MFA of Turkmenistan, Executive Committee IFAS, representatives of diplomatic missions and international organizations, experts, ecologist, NGOs, as well as editors of periodicals and accredited journalist participated in the event. The speakers underlined the importance of the event in enhancing Fund’s work on cooperation for the benefit of nations in Central Asian region and expressed that the Heads of States-founders IFAS Summit was well organized. The last one was hosted in 2009. In the course of preparation works for summit, Program of actions on providing assistance to the countries of the Aral Sea Basin (ASBP-4) and Concept of UN Special Program for the Aral Sea Basin were developed. In this regard, the concept proposed by the President of Turkmenistan to create legal mechanism taking into account interest of all states in the region on integrated management of water resources taking into consideration climate change and shortage of water resources was echoed. Turkmen Leader’s systemic approach to accomplish tasks set by IFAS was underlined and participants noted the importance of initiative to hold meetings at ministerial and expert level before regional summits. In addition to that, the role of establishing institute such as Consultation council of the heads of Central Asian states was discussed. In the framework of the summit, the heads of reputable international organizations such as the UN, OSCE and CIS will be invited and this will further strenghthen international community interaction in saving and preserving the Aral Sea. Overall, presenters had agreed that, the outcomes of Summit are the facts of consolidated approach of Central Asian states to address emerging issues in regional development. The participants of the briefing expressed their confidence in proposals and initiatives that have been stated in joint communiqué and they will help to identify key directions within IFAS and be reflected in practical implementation on improving environmental conditions in the region.